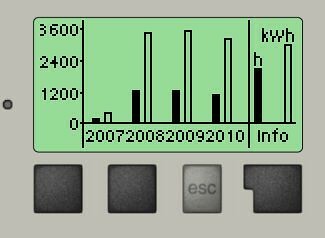 Forgive me reader, it’s been over two years since I last blogged the annual performance of my solar panel. A photo this time rather than a screen shot as since I upgraded my computer I have been unable to re-download the software that would allow me to connect my new computer to the controller. This is rather annoying because I paid extra for the computer control facility. 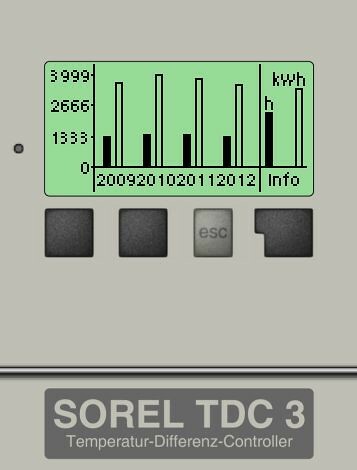 Rather suspiciously, the controller reports almost identical kWh outputs for the last two years, although that is lower than the previous three. I will estimate it as 2,700 kWh per year. Nottingham Energy Partnership have an Energy Costs Comparison table. I neglected to look at it last year, so will have to use the data from last month now to estimate the financial value of the heat we got from the sun. I use the gas rate of 4.6p/kWh, since if the water were not heated by the solar panel, it would be heated by gas. That means the solar panel gathered around £124 of energy in each of 2016 and 2017. The running total to the end of 2016 is therefore £1,508 and at the end of 2017, £1,632. September will see the eleventh year of operation. When it was installed, we needed to put in a new hot water tank which was bigger than the old one, so the installers had to demolish my airing cupboard to fit it in. In the eleven years since, I have yet to sort it out. There are all sorts of flawed assumptions being made to come to that figure, so take it with a fairly large pinch of salt. If you are considering a solar panel of your own, whether for hot water or to generate electricity, and you live vaguely near Nottingham, do please get in touch with Sungain at Nottingham Energy Partnership, who would be delighted to let you know what to do next. You can also follow them on Twitter, and they also have a very helpful service on their website that lets you compare your electricity and gas tariffs and see if you can save money. Buckets more information about my own solar panel under this link. Another year, another desperately late solar panel performance post. It’s been sitting on my to-do list since January 2nd, but at least writing this will let me tick off something today. 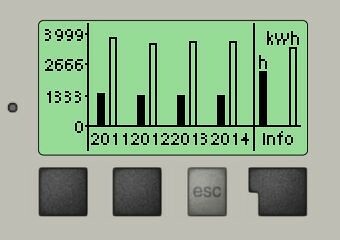 2013 has an ever so slight edge on 2012 so we’ll estimate the kWh as 3,800. Sadly once the year is over the more detailed records are not accessible through the controller app. Nottingham Energy Partnership have an Energy Costs Comparison table. I neglected to look at it last year, so will have to use the data from last month now to estimate the financial value of the heat we got from the sun. I use the gas rate of 4.19p/kWh, since if the water were not heated by the solar panel, it would be heated by gas. Interestingly this is the lowest price for gas since 2009, according to my records. That means the solar panel gathered around £159 of energy last year. The running total to the end of 2013 is therefore £990 and will clearly top a thousand pounds next year. So last year continued a downward trend that looks like it will be over by the end of 2013. 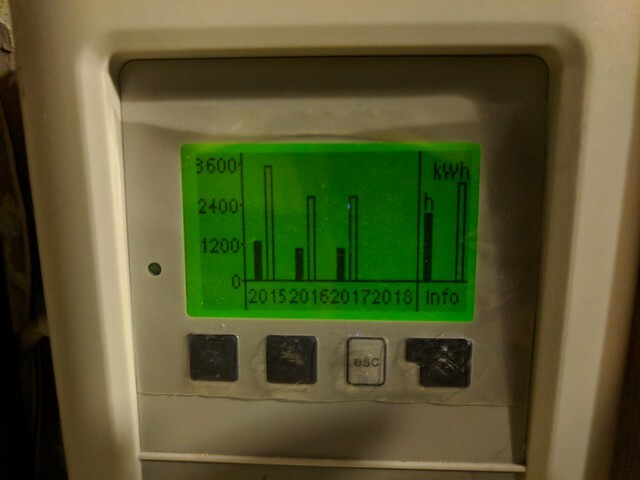 At this stage in the year, the graph is the only source of information still recorded so we’ll have to guesstimate the heat output as 3666kWh. Nottingham Energy Partnership have an Energy Costs Comparison table. I neglected to look at it last year, so will have to use the data from last month now to estimate the financial value of the heat we got from the sun. I use the gas rate of 5.06p/kWh, since if the water were not heated by the solar panel, it would be heated by gas. Interestingly this appears to be a lower cost than last year’s gas cost. 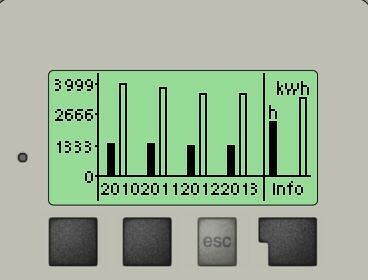 That means the solar panel gathered around £185.50 of energy last year. The running total to the end of 2012 is therefore £831.06. This year I have had my annual half-hearted attempt to work out if it’s possible to do more comprehensive data logging using the equipment I have. I did pay extra for the ethernet connection with the idea of putting some sort of graph on my website to show how the system is doing in real time. I’m super jealous of this guy who has done exactly that with the same setup as me. And as a favour to everyone else he has made public the code to do it. And I don’t have a clue what any of it means or how to use it! So last year was a little under the year before. At this stage in the year, the graph is the only source of information still recorded so we’ll have to guesstimate the heat output as 3700. The running total to the end of 2011 is therefore £645.56. It’s a bit rum writing a post about this so many months into 2011, but it is supposed to be an annual thing, after all! As the yearly data graph shows, despite feeling a little disappointing, last summer, or at least the year as a whole, provided more hot water through my solar evacuated tubes than any previous since the installation was put in. Nottingham Energy Partnership have an Energy Costs Comparison table. I neglected to look at it last year, so will have to use the data from last month now to estimate the financial value of the heat we got from the sun. At 4.40 pence per kWh, the value adds up to £175.96. The running total to the end of 2010 is therefore £451.68. But if you are considering a solar panel of your own, whether for hot water or to generate electricity, and you live vaguely near Nottingham, do please get in touch with Sungain at Nottingham Energy Partnership, who would be delighted to let you know what to do next. You can also follow them on Twitter, and they also have a very helpful service on their website that lets you compare your electricity and gas tariffs and see if you can save money. Is it worth getting a solar panel? A recent commenter asked this on an old post about installing my solar panel, and I spent a few minutes writing an answer. Rather than keep it buried in a comments thread on a post from years ago, I thought I would copy it here again. Alison – my most recent solar post is here. For much of the last year, I’ve not been able to get screenshots off the computer gizmo that duplicates the controller in the airing cupboard. Turns out, once the room was tidied up a bit and I could track the cables back, that the Cat 5 cable that comes out of the airing cupboard to the nerve centre had just dropped out of the back of the router. 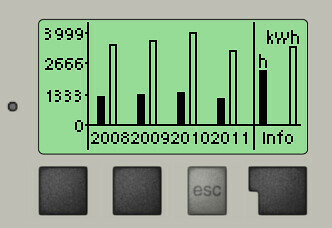 But from the graph I can pull now, it looks like we got the best part of of 3,600 kWh in both 2008 and 2009. And the good news seems to be that we’ve already had as much sun by mid-August than we had in the whole of the last two years. But we did have some really good weeks in May and June that seemed to have a made an impact on the bottom line on the solar front. And 3,600 kWh worth of gas would have been another £140 or so, if I’m doing the multiplication correctly based on Nottingham Energy Partnership’s energy cost comparison table.